BLTN? What does that stand for? Bulletin? No, it stands for Better Late Than Never, as in reviews of games too recent to be retro reviewed and too old to be all-new reviews. Today's subject is Tales of the Abyss for the Nintendo 3DS. Not abyss-mal, but not great either. 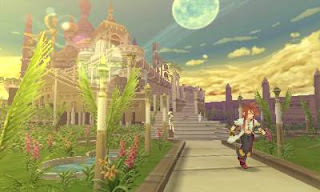 The Tales franchise has mostly held up residence on PlayStation platforms. The latest in the series, Tales of Xillia, has found nice success overseas and a recent release on this side of the Pacific. Still, Nintendo platform owners haven't been completely starved of Tales content. The Wii saw a sequel to one of the most popular Tales entries, Tales of Symphonia, and even saw an exclusive entry in the series with Tales of Graces, though the Wii original never made it out of Japan, but saw a remake on the PlayStation 3 which did. 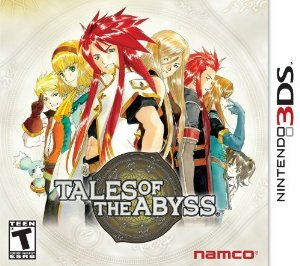 Last year, Nintendo 3DS owners received a port of Tales of the Abyss, a 2005-2006 PlayStation 2 game. Does this port do the original justice? Is it worth a double dip? 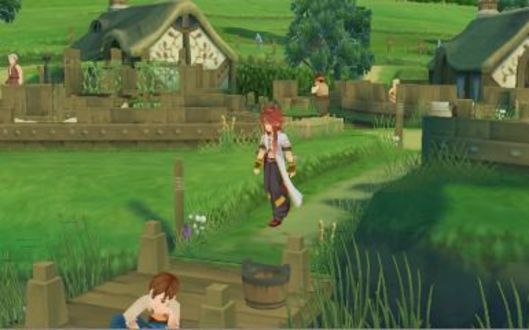 Ever since he was kidnapped seven years ago and subsequently lost all of his memories, protagonist Luke fon Fabre, son of the king and queen of Kimlasca-Lanvaldear, is kept under close surveillance, confined to the castle. This isolation has made him a bit of a snotty brat-- okay, he idles on being a snotty brat. One day a mysterious woman breaks into the castle, starting a series of events that takes Luke into the center of a conflict between two kingdoms and ultimately the fate of the world. The story is a mess of gibberish terms that are repeated over and over again, the cast of characters are some of the most obnoxious I've ever had the displeasure of playing as, and starting out, Luke is insufferable with his selfishness.The writers attempt to use his naivete from being isolated and thrust into the world not knowing anything for humor, but these segments just fall flat and aren't funny. Everything else is your standard series of anime conventions wrapped up in a sheet of cliches, whether they be in the main story or through optional skits. Mieu will test a lot of players' patience. 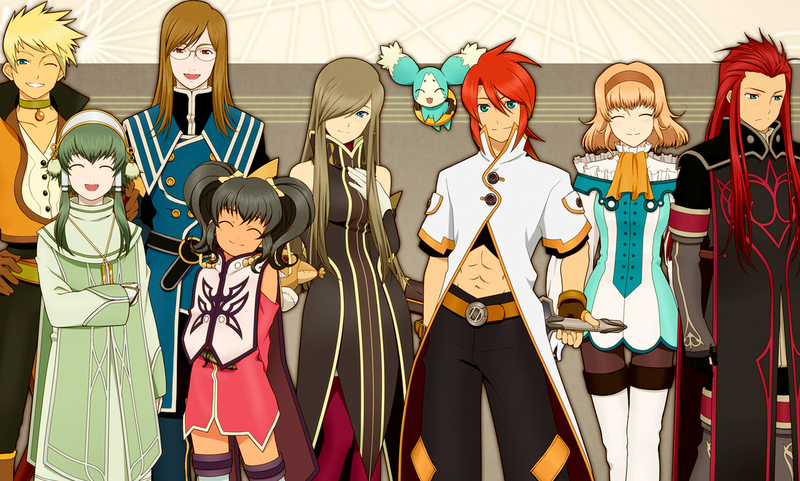 Speaking of conventions, Tales of the Abyss doesn't stray far from what is expected of a JRPG. You explore towns, dungeons, and the world map as you progress the story. Towns house multiple denizens that will speak their peace, shops are available to load up on gear and items, and inns allow Luke's party to get some much needed R&R. 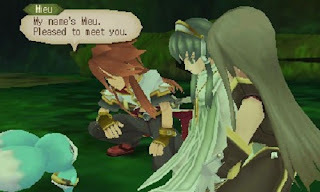 Dungeons possess puzzles to solve, either through normal means or interacting with the environment with the abilities of Mieu, a high-pitched mascot for the game. Enemy encounters in dungeons and the world map do not happen randomly. When a monster comes in contact with Luke, a battle commences. Depending on if Luke's party gets blindsided by having a monster run into Luke on the map from behind, the cast involved in the battle will be shaken up. Luke at the old fishin' hole. Every JRPG that is worthwhile possesses an entertaining battle system. After all, if the combat isn't up to par, what is normally the most exciting part of a JRPG, then what is the point of playing it? 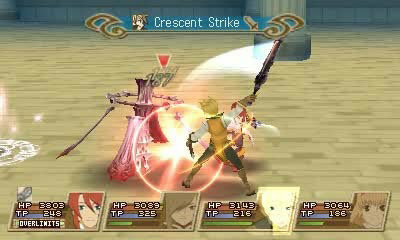 Thankfully, Tales of the Abyss satisfies with its combat system. Similar to what was seen in Tales of Symphonia, the combat in Tales of the Abyss takes place in real time, with the player taking control of one of the four active party members. One can attack, block, use skills (whether they be offensive or defensive), and utilize a number of commands via calling up a menu. 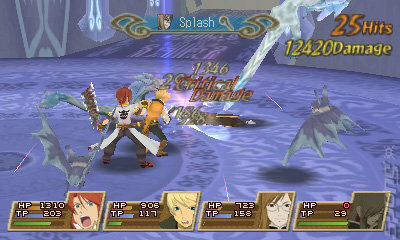 Unlike Symphonia, however, Tales of the Abyss has a free run ability, letting a character run with absolute freedom around the battlefield. Also, Abyss has a much improved camera system that zooms out when party members are apart, showing all of them on screen at the same time. Guy carves up some enemy fodder. AD Skills are skills that be equipped and removed at the player's beck and call. These skills are learned as items called Capacity Cores are used. These give Luke and his party statistical upgrades when they gain experience levels. As specific statistics reach high levels, new AD Skills are learned. In battle, these skills and magic have certain elemental effects that can be used to players' advantage. Using multiple skills and magic of the same element will build power in a circle on the battlefield, known as the Field of Fonons. When charged up, a party member can use a skill that is the exact element of the circle to unleash a powerful attack. Enemies can also use this tactic to their advantage. Powerful attacks don't end there either, as party members and enemies can use Over Limit, nerfing damage and increasing their attack capabilities to surprising and devastating levels. A Mystic Arte, a character's most damaging skill, to turn the tide of battle. Nonetheless, a lot of battles still end up to mindless button-mashing, a common problem for the Tales series that is unresolved with Tales of the Abyss. While this game offers many new concepts, a good deal of familiar elements of the Tales series live on in Tales of the Abyss. For instance, after each battle you are given a grade, points that are used during New Game+ to purchase helpful bonuses like double experience and having a party's stats carry over. Characters can also earn titles from engaging in specific events (usually optional) throughout the game. Lastly, players can come across unique recipes through doing some exploring, which allows them to cook food for the party, creating helpful healing items for in and out of battle. 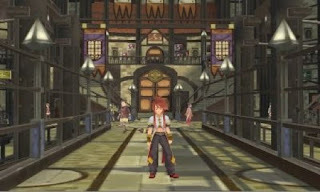 Tales of the Abyss on the Nintendo 3DS looks about the same as the PlayStation 2 original, and that's not a bad thing at all. Sure, the graphics are a little long in the tooth in some parts, but overall the game looks and runs great. The frame-rate is solid, which couldn't be said of the PS2 game. However, the advertised 3D effect is poorly executed and will can make for some literal headaches. Objects that should be popped out fall to the back, and there's a hefty case of ghosting involved. The voice acting is the same as the PS2 version, which is unfortunate, as the skits (which there are numerous) are still completely lacking voicework. The fact that you can't hit a button to speed them along made me just not engage in them altogether. Meanwhile, the music is actually largely forgettable. Only the battle themes and some of the town themes remain in my memory. It's one of Motoi Sakuraba's weaker, more phoned-in soundtracks. Some areas are still breathtaking. As it stands, Tales of the Abyss on the Nintendo 3DS is a tough recommendation to make for those who have already played the PlayStation 2 original. The biggest inclusion and selling point, the stereoscopic 3D, actually makes the game look worse. Still, if you can tolerate the abhorrent cast, anime cliches, and mediocre story, there is a fun RPG with a terrific battle system to be had on a handheld that doesn't have a large number of them yet.